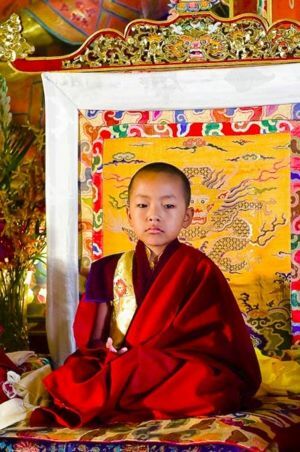 Urgyen Jigme Rabsel Dawa, or Tulku Urgyen Yangsi Rinpoche (b.2001) — the reincarnation of Tulku Urgyen Rinpoche, born as the son of Neten Chokling Rinpoche and Tendzin Choyang Gyari (Sangyum Choyang). He was born in the U.S.A. during the Tibetan year of the snake and was later recognized by Kyabjé Trulshik Rinpoche as the reincarnation of Tulku Urgyen Rinpoche. He has been formally enthroned at Ka-Nying Shedrub Ling Monastery (the monastery built by his predecessor), Boudhanath, Nepal, during Lha Bab Düchen, on the 19th November 2008. This page was last edited on 24 July 2009, at 20:32.